O God, who through the preaching of Saint Francis Xavier won many peoples to yourself, grant that the hearts of the faithful may burn with the same zeal for the faith and that Holy Church may everywhere rejoice in an abundance of offspring. Through our Lord Jesus Christ, your Son, who lives and reigns with you in the unity of the Holy Spirit, one God, for ever and ever. This saint, one of the Church's most illustrious missionaries, came from a noble Basque family in Spain. He studied at the University of Paris, where he taught philosophy after obtaining his degree of master of arts. Here he met Ignatius of Loyola and was enrolled as one of the first seven Jesuits. They decided to go to the Holy Land, but the war between the Turks and Venice prevented this, so for a time Francis labored at Padua, Bologna, and Rome. In 1540 Ignatius chose him as the first missionary to the Portuguese East Indies. Francis sailed from Lisbon armed with four papal briefs making him nuncio with full powers and recommending him to the Eastern princes. He landed at Goa in India and began a vast apostolate lasting over ten years. Here he instructed the adults, gathered the children by ringing a bell in the streets, catechized them, and also visited the hospitals and prisons. He then turned to the native Indians, teaching the simple folk by versifying Catholic doctrine and fitting the verses to popular tunes. He then went on to Cape Comorin and began the conversion of the Paravas, some days baptizing so many that at night he could not raise his arm from fatigue. Then to Travencore where he founded forty-five churches in various villages. Then to Malacca in Malaya, and for eighteen months from island to island, preaching, instructing, baptizing. On his return to Goa he heard of the vast harvest of souls awaiting the laborers in Japan and he set out for this field with several companions, arriving at Kagoshima in 1549. He set himself to learn the language and started to preach and teach with such success that twelve years later his converts were found still retaining their first fervor. In 1551 he returned to Malacca to revisit his converts in India. Now a new goal loomed up before his eyes—pagan China, but he was not to reach it. Arriving on the island of Sancian at the mouth of the Canton river, he became ill of a fever and would have died abandoned on the burning sands of the shore if a poor man named Alvarez had not taken him to his hut. Here he lingered for two weeks, praying between spells of delirium, and finally died, his eyes fixed with great tenderness on his crucifix. He was buried in a shallow grave and his body covered with quicklime, but when exhumed three months later it was found fresh and incorrupt. It was taken to Goa where it is still enshrined. St. Francis Xavier was proclaimed patron of foreign missions and of all missionary works by Pope St. Pius X.
Patron: African missions; diocese of Alexandria, Louisiana; Apostleship of Prayer; Australia; black missions; Borneo; China; East Indies; foreign missions; Goa, India; diocese of Green Bay, Wisconsin; India; archdiocese of Indianapolis, Indiana; Japan; diocese of Joiliet, Illinois; missionaries; Missioners of the Precious Blood; Navarre, Spain; navigators; New Zealand; parish missions; plague epidemics; Propagation of the Faith. Symbols: bell; crucifix; vessel; Pilgrim's staff; rosary; lily; font; ship and crucifix; globe. Often portrayed as: young bearded Jesuit with a torch, flame, cross and lily; young bearded Jesuit in the company of Saint Ignatius Loyola; preacher carrying a flaming heart. What does it mean to be an apostle? 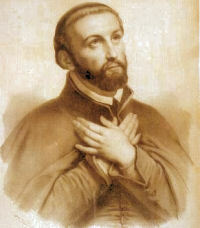 Consider how you might imitate St. Francis Xavier in apostolic works in your own situation. Read this letter from St. Francis to St. Ignatius to get an idea of his zeal. Read some more about St. Francis and ideas for Celebrating the Feast of St. Francis Xavier. St. Francis was sent to India and Japan. Pray for the Church in these countries, and learn more about the modern Church in India here and here, read about the history of the Church in Japan. Find out about and support the Holy Childhood Association (St. Francis always started with the children first). Teach your children to pray St. Francis' favorite prayer, "Give me souls" when they have some suffering to offer up. Spend some time meditating on St. Ignatius' response to St. Francis before his conversion, "What does it profit a man if he gains the whole world but suffers the loss of his soul?" Say the Litany of St. Francis Xavier. Make a big pot of soup for the Feast of St. Francis Xavier. Study some beautiful art depicting St. Francis Xavier at Olga's Gallery.